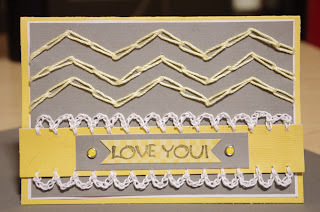 Here is my latest Sharp Crochet Hook creation- the yellow, white, and gray chevron style "Love You!" handmade card. You can use the Sharp Crochet Hook to crochet right through the paper to crochet any shape you want. The yellow chevron style zig-zag pattern was made using Red Heart size 3 crochet thread and the scallop edging in white was done with Red Heart size 10 crochet thread. 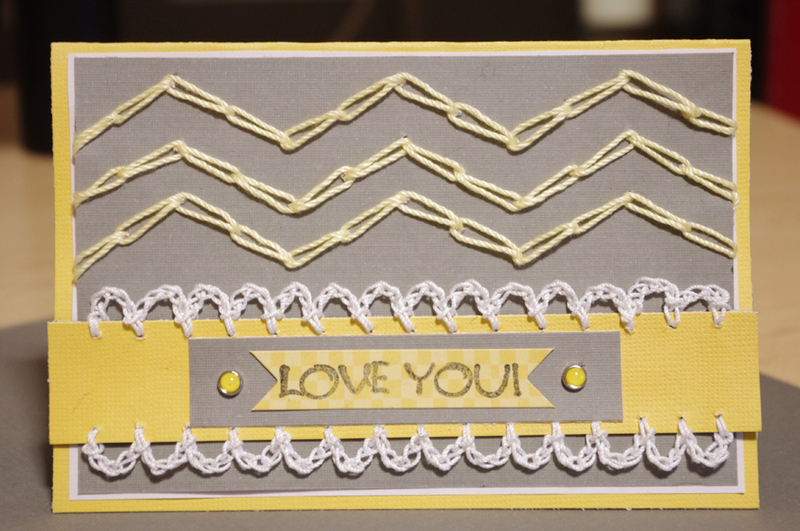 Get the Sharp Crochet Hook and make someone you love a card today! Go here: www.sharpcrochethook.com. The Sharp Crochet Hook is a really handy tool that is ideal for crocheting through fabric or paper to create really stunning edgings. Now you don't have to prepoke holes or pay to get it hemstitched. You can use the Sharp Crochet Hook to crochet edgings through fabric for baby blankets, pillowcases, skirt hems, appliques, socks, gloves, etc. You can also use the Sharp Crochet Hook to crochet edgings through paper for cards, scrapbook pages, etc. 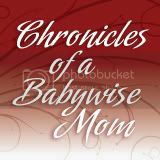 It makes it fun, easy, and convenient. The Sharp Crochet Hook is patent pending. Click here to order one: www.sharpcrochethook.com. The Sharp Crochet Hook is patent pending. Powered by Blogger.